Even though the sun was already out by the time we started loading the bikes, the temperature readout on the dashboard was only 4 degrees Celsius. 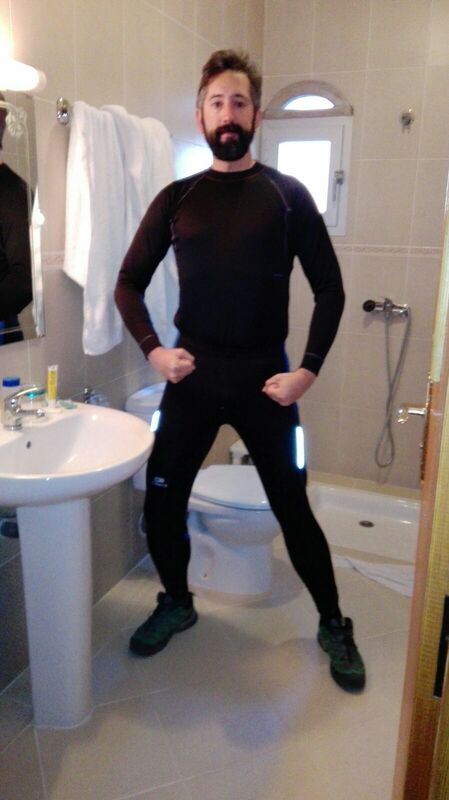 Today was going to be the big day, the last big challenge before we started to ride back home. 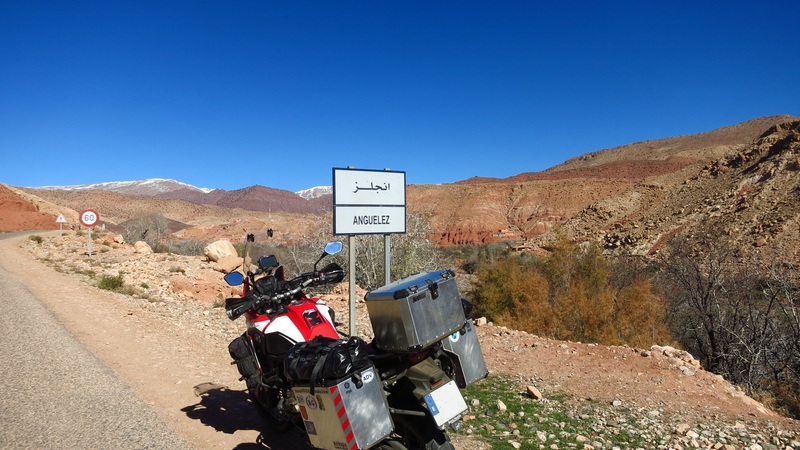 There were two points during our trip that we considered potentially difficult – crossing the Middle Atlas on the way south to Merzouga, and crossing the High Atlas on the way back up to Marrakech. The first one had posed no problem, we had had good weather and even though we had found snow at the highest points, the roads were clear and temperatures were low but reasonable. 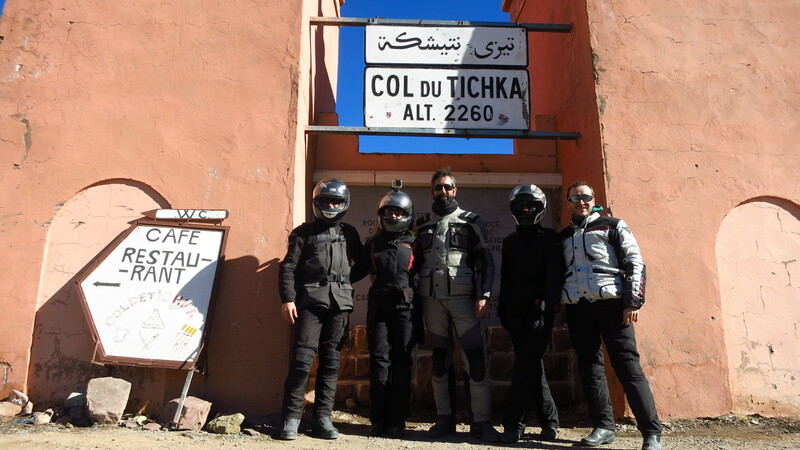 This time though we were going even higher, through the famous Tizi n’Tichka pass. 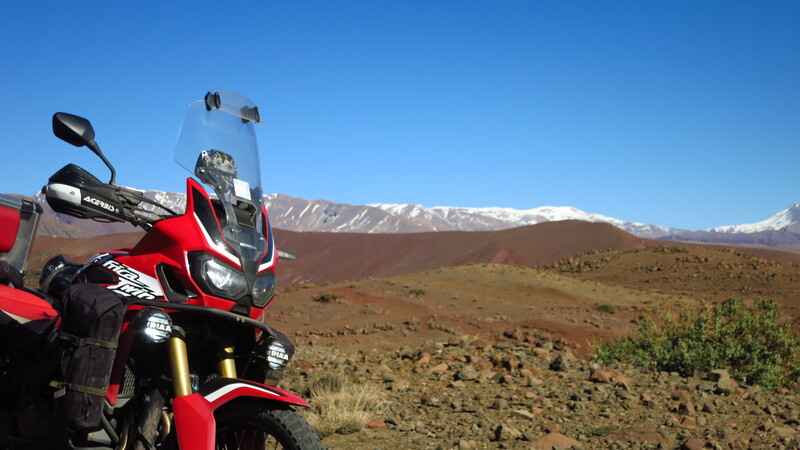 In the last few days I had been sent several pictures and videos of people who were riding in different points of the Atlas mountains and general reports were of snow and cold. The usual image of a winding road against a brown rocky background had been replaced with a white blanket of snow and a thin black line of tarmac zigzagging up the mountains. Even though we had been assured that the road was a main thoroughfare across the Atlas and it was kept clear of snow, we feared that temperatures might be very low, so for the first time in the trip I rolled out the heavy artillery – winter running tights to wear underneath the riding pants, silk socks under thick wool ones, silk gloves under the regular ones and an extra layer under my fleece. 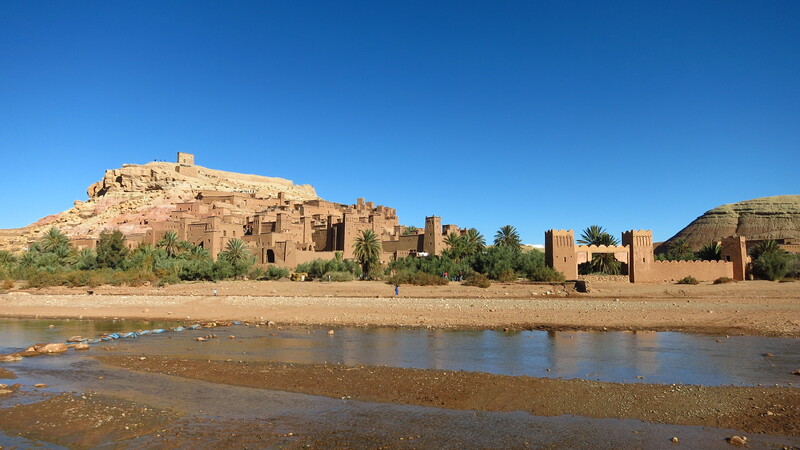 Before attacking the pass we wanted to visit Ait Benhaddou, the famous mud brick fortified city that has featured in countless films. It was a beautiful sunny day, and when we parked our bikes and crossed the river to the city entrance the temperature was quite high. 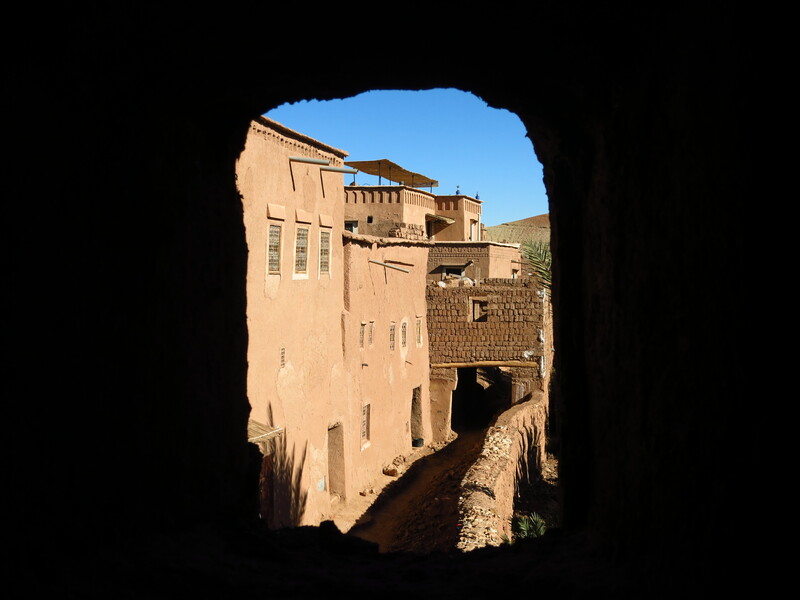 The first thing we visited was the kasbah, a dark and cold maze of narrow corridors, staircases and rooms, but when we stepped out in the sun and started walking up the city streets all dressed up for the cold we soon regretted our decision to wear so many clothes. The visit was worth sweating a bit, though, and we were soon on the bikes again, so we kept them on. 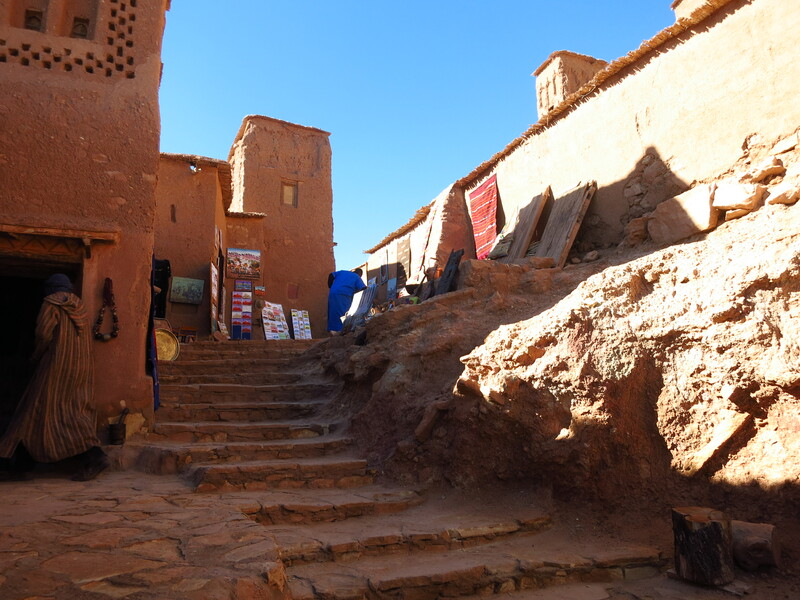 A couple of days earlier, a friend had recommended a more scenic alternative to get to the Tizi n’Tichka – instead of going back to the main road after visiting Ait Benhaddou there is a small local road that continues past it and goes through several tiny mountain villages before joining the main road just before the pass. With such nice weather we thought we would risk it and take this route. We were soon way off the beaten track on a narrow road with no traffic going up a beautiful rocky valley with small mud brick villages appearing here and there. In all of them children came running out to meet us on the road when they heard the roaring of the bikes approach their houses – no matter where you are in the world, all kids are strangely fascinated by these machines. 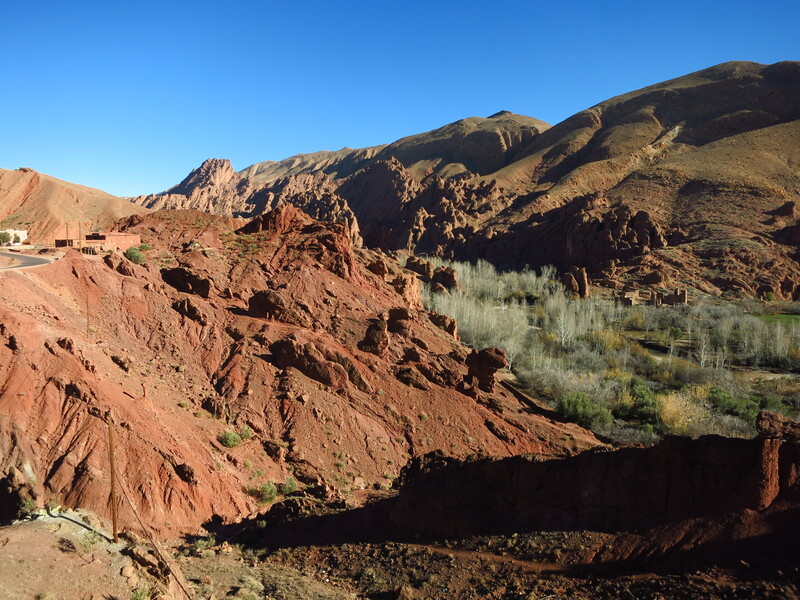 The landscape changed from dusty rocks to dark brown clay as we gained altitude and then the valley opened into a fertile plain where our route turned west and we caught sight of the mountains we were going to cross. 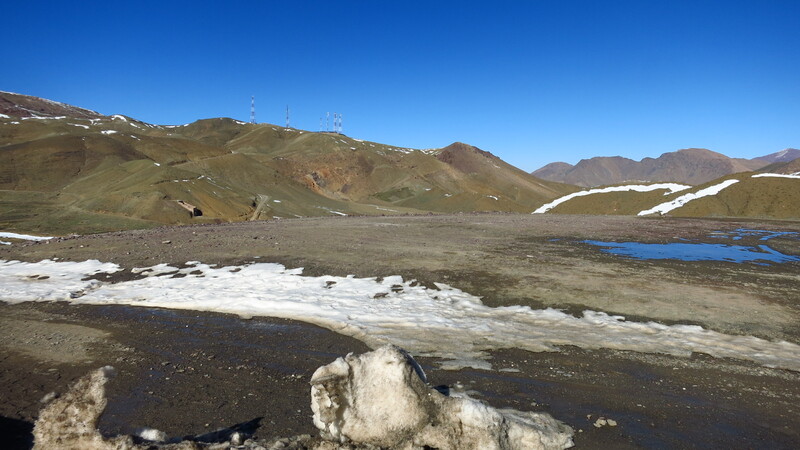 There seemed to be a lot less snow than we had anticipated, and the temperatures remained reassuringly warm as we kept climbing. Soon we started to see pine trees by the side of the road and there was also snow here and there, but it was clear that most of what we had seen in pictures from a few weeks earlier had melted away. We were very close to the main road now, and a thought crossed my mind – this was a very small road, and I was sure it was not cleared of snow as regularly as the main road to the pass. 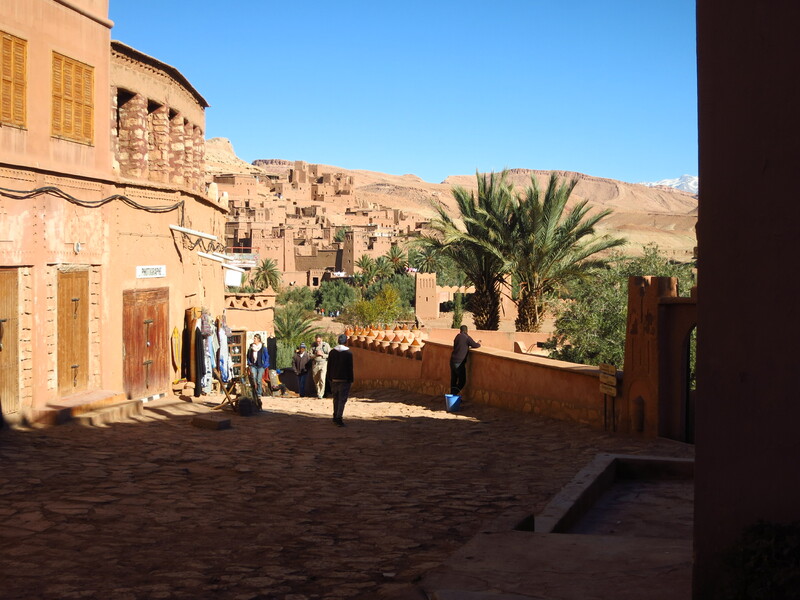 All it would take at this point was some snow across the road, say 20 or 30 metres, to make us have to go all the way back to Ait Benhaddou and up the national road, losing several precious hours. 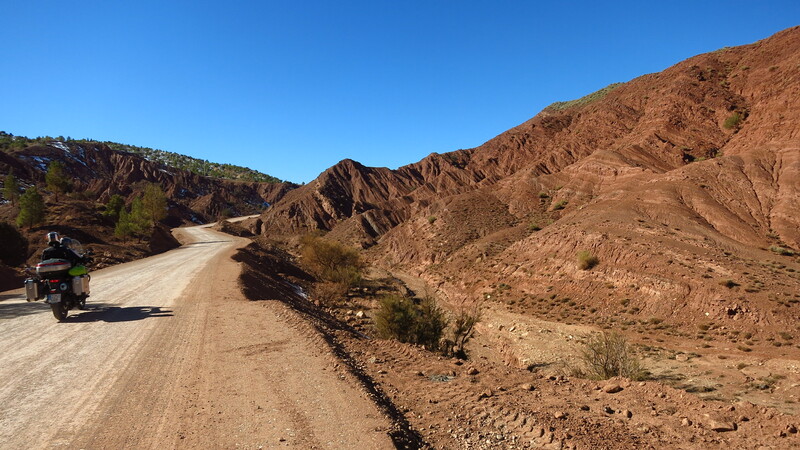 Fortunately, we met the main road without any further incident and soon we were at the top of the Tizi n’Tichka. We had been very lucky and enjoyed great weather and some of the best views of our trip. 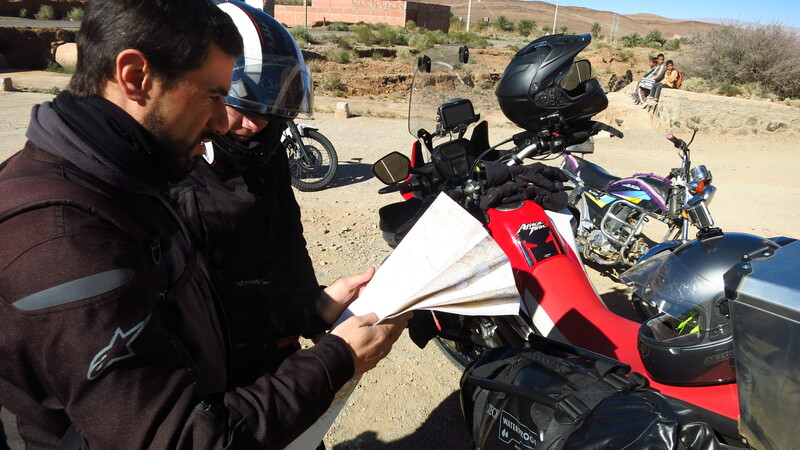 It was now time to face the following adventure – the infamous traffic of Marrakech, a daunting prospect that was not made any easier by the fact that our hotel was in the old city, a maze of narrow streets infested with suicidal scooter riders. 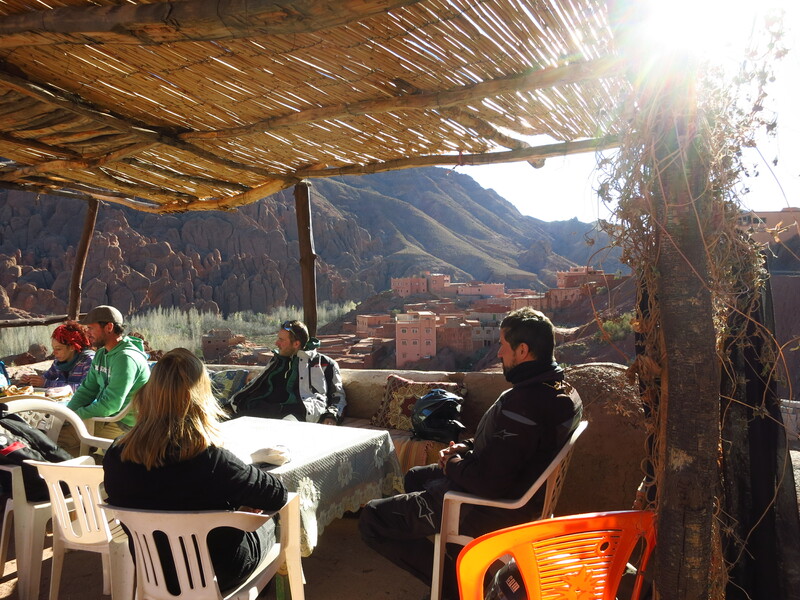 After a long ride down the other side of the Atlas range with a short stop to remove several layers of clothes we reached the outskirts of the city. At first the traffic was reasonable – seen for the first time it might have appeared chaotic and dangerous, but there was a kind of order in the chaos, with scooters, pedestrians, cars, trucks, buses and taxis all moving within millimetres of one another but miraculously avoiding touching. We reached one of the doors in the wall around the all city and things got a lot more interesting here. The GPS sent us down a narrow alley with lots of people and scooters, and our bikes felt like lumbering elephants inching ahead among a blur of movement. We reached a small square full of parked cars and pulled aside for a moment to locate our riad. We were relieved to see that it was just around the corner, but not so happy when, having unloaded the bikes we asked where we could park them and they said that they had no private parking. 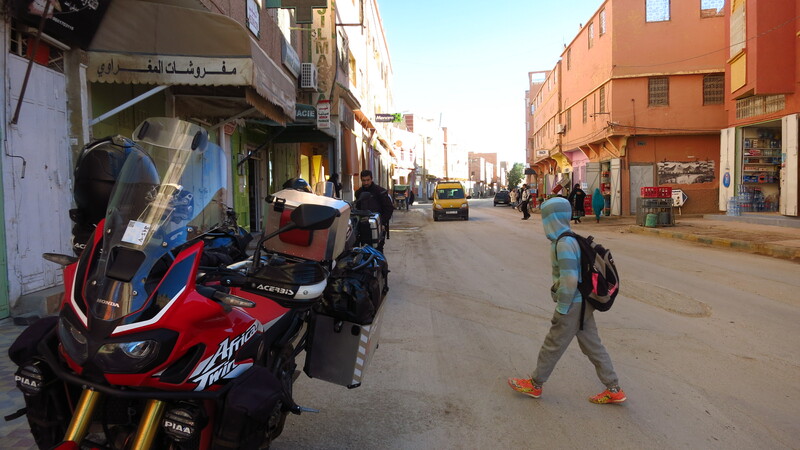 We did not want to leave them out in the street in such a chaotic place, so after a lot of arguing the guy in the hotel told us to follow a friend of his who had another riad with a courtyard that was accessible from the street and who agreed to let us park the bikes inside. We went into an even narrower street and he opened a small wooden door and gestured me to take the bike through it. It was clearly too narrow for the handlebars, and there was a high step down into it, so when I tried to put the wheel in first and then twist the bars to get one side in and then the other, the only thing I managed to do was to get stuck. The man had to pushed me back out, while two more guys pulled from behind to take the bike out in the alley again. 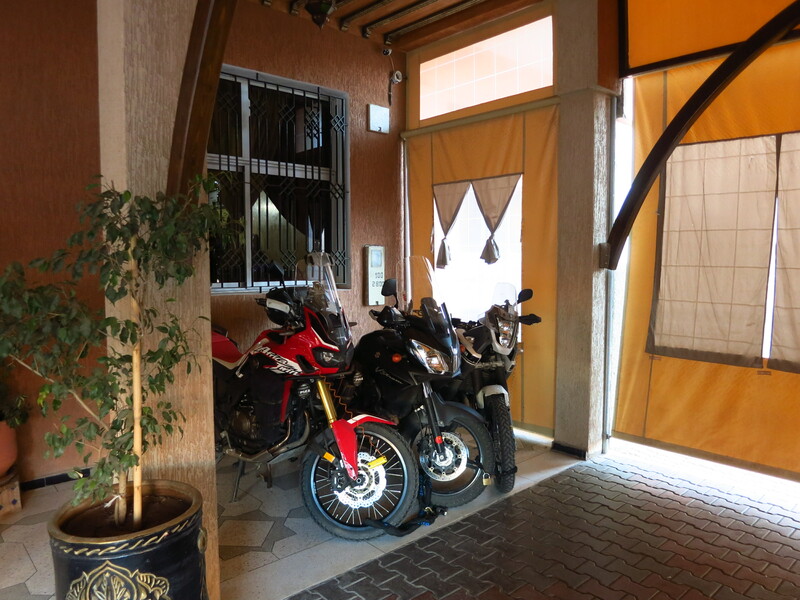 It was impossible to park the bikes there, and the only alternative was to park them in the square, where we had to pay 50 dirhams and some guys would keep an eye on them all night. The security guard from the riad who had been helping us far swore that the bikes would be safe, and the guys in the square showed us that there were a couple of big motorbikes under some blankets parked between some dusty scooters, so in the end we agreed to leave them there. 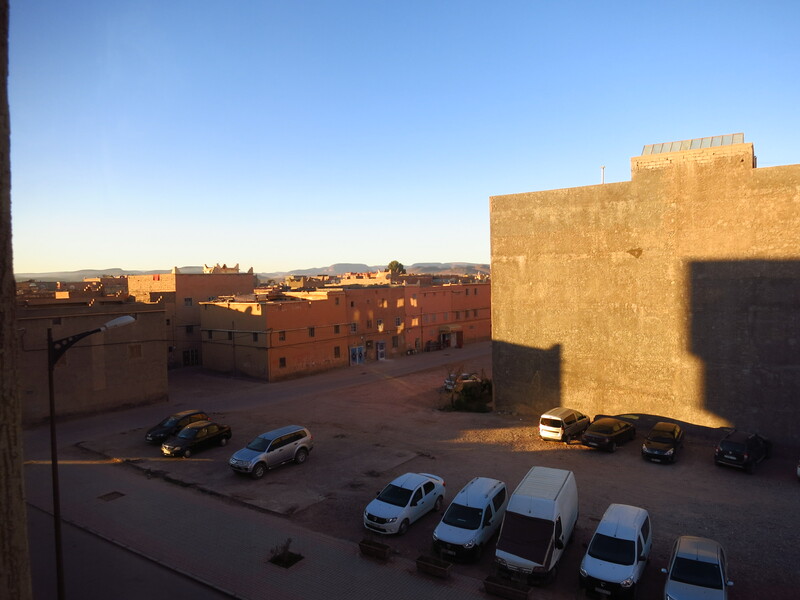 The second disappointment with the riad came when we told them that we had decided to spend an extra night there to have time to visit the city after Nat had taken her flight back home and they showed no interest whatsoever in extending our stay. ‘Check whether there are available rooms on Booking.com’, the guy said. We were tired after a long day on the road and trying to find a place for the bikes, so we decided to have a shower, get changed and then look up alternatives online to spend that extra night. After we agreed on a couple of places that looked good we went out to find a place to have dinner and visit the medina. 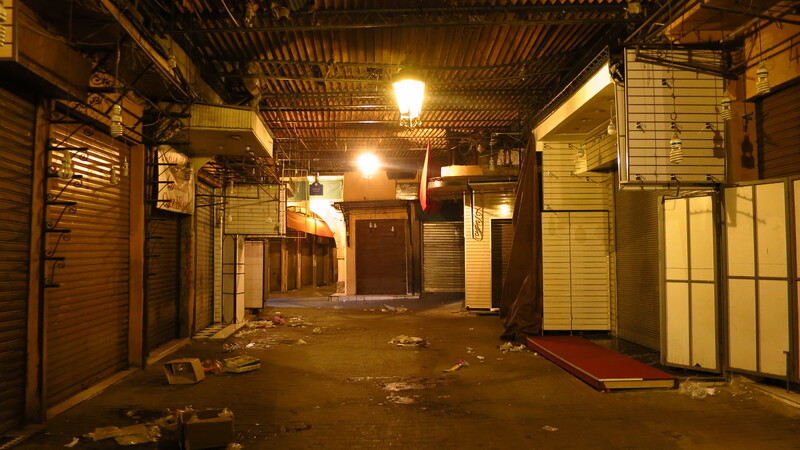 If the streets leading to the riad had seemed chaotic, going deeper into the medina was even worse. The streets were narrower, there were thousands of small stalls selling all kinds of stuff to tourists, each of them with an over eager guy trying to get people into his by singing ‘amigo amigo’ or the equivalent in any language they needed, while all the time locals on scooters zoomed past, rendering the air unbreathable. We found a quiet restaurant and had an early dinner before heading to the main square to see if there were going to be any special celebrations for the new year, but found that the party was in the new part of the city, not here. 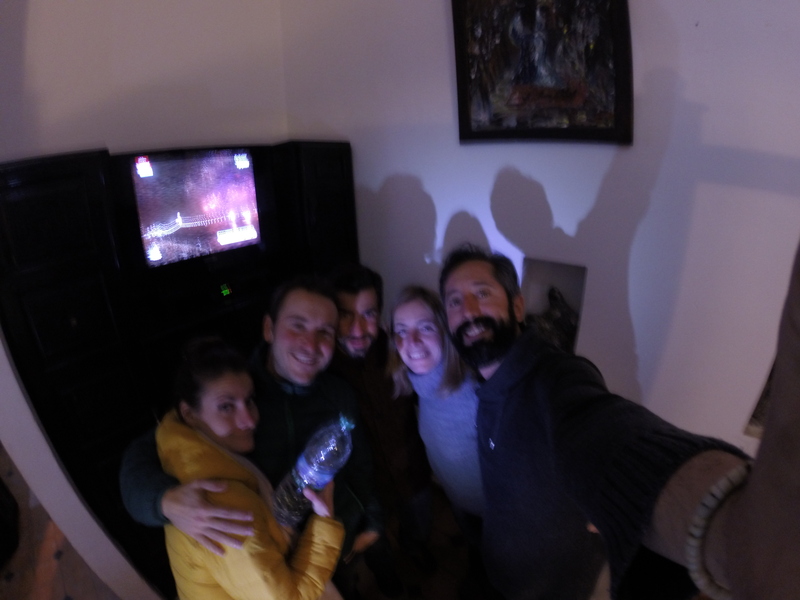 We wanted to hang around until midnight and celebrate out in the streets, but as the time went by the stalls closed and the streets emptied, and we were feeling cold and tired, so we decided to get back to our hotel and welcome the New Year there.